Ranger Ross, a photo by The Bacher Family on Flickr. 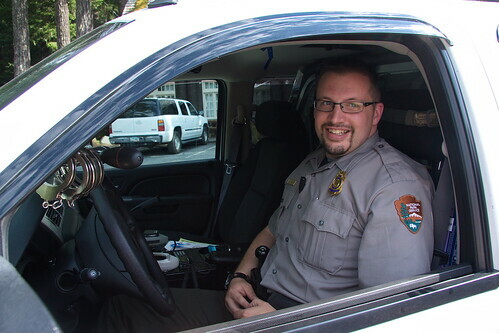 This is a picture of my good friend Kevin, who is a park ranger at Mount Rainier National Park. It was the handcuffs that caught my eye, and I angled my photo so that they were prominently in the foreground. He gave me a nice smile when he saw I was taking his picture, and I'm pleased with the result. The white vehicle kind of washes out in order to achieve proper lighting on the face, but that's a small price to pay for a nice portrait.